Photo credit: Michael Alexander, The Georgia Bulletin. Emory Saint Joseph’s celebrated the annual Feast of Saint Joseph, with a special recognition service honoring the patron saint of the hospital. 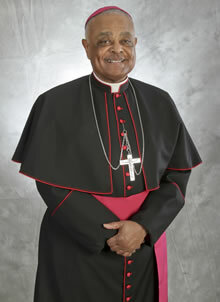 The Most Reverend Wilton D. Gregory, the Archbishop of Atlanta, presented a reflection during the service, speaking about the tradition of saints and the importance of honoring heroes of faith. The Feast of Saint Joseph, also known as Saint Joseph’s Day, celebrates the husband of the Blessed Virgin Mary. The name of Saint Joseph was given to Emory Saint Joseph’s and many other hospitals because of its association with a guardian/protector. Just as Joseph protected and provided for Mary and Jesus, Emory Saint Joseph’s continues the mission of the Sisters of Mercy in this same spirit by providing compassionate, clinically excellent health care to those in need, with special attention to the poor and vulnerable. Each patient at Emory Saint Joseph’s received a card on their meal trays explaining the significance of Saint Joseph’s Day and the hospital’s continued commitment to the Mercy mission. Saint Joseph’s Day also marked the 37th anniversary of the hospital’s move from downtown Atlanta to its current location on Peachtree Dunwoody Road.